1. (We see the Nostromo and its refineries and tankers, in space, above the alien planet.) "The signal's coming from that planet." says... someone. "What about the refineries?" asks another. "Let's go have a look." "We can leave them here." 2. Dallas (?) is sat by a viewport watching the planet. "Look at those clouds. Purple??" 3. "Just a planetoid" says Dallas. "Any rotation?" asks Brash (Brett/Ash). "Yeah 'bout 2 hours." Dallas replies. So, the crew have decided to go and investigate. Way to go Ripley! Thanks for that. Good call. The Nostromo was too big here and got a rather crude reduction treatment. By the looks of things my wee 2 year old sister Candace had a go too with an orange marker. I like the colour - she had a good eye. She's presently writing her doctoral thesis in Design History. This comic was her springboard into the art world. So is that Captain Dallas with the red biro hair? You have to understand readers: all I had to go on for visual refernces was Alan Dean Foster's novelisation (which is in the post as I type this). I just ordered a second hand copy on Amazon. My old one must have been yet another book lent to friends and never seen again. The pictures in the middle of that were just pure gold. 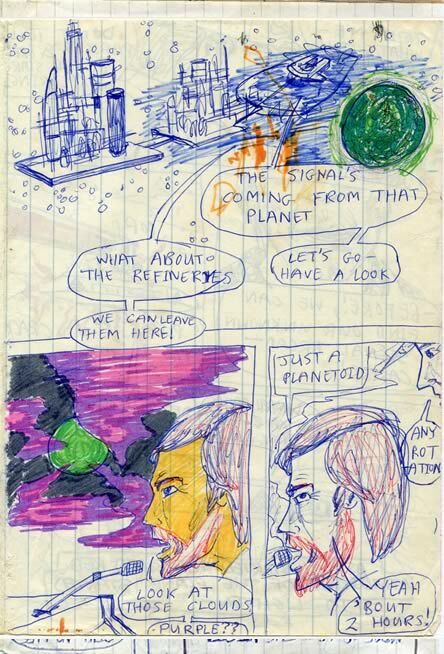 Now when I drew Star Wars age 9, at least I'd seen the film - once. I wouldn't see ALIEN or any photos other than the in the novel- for years. So, er... why do you think the usually reticent Brett appears to actually give a crap about planetary rotation and the like in the last panel?